Our Valletta cruise port guide gives you information about the docking location, cruise dock, transportation options and much more! 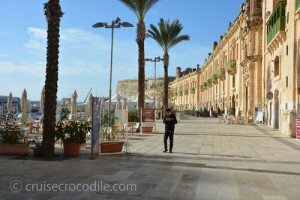 Welcome to Valletta’s cruise port guide. Valletta is the capital city of the Republic of Malta. It might be surprising to know that there are not even 7000 people that call Valletta home. 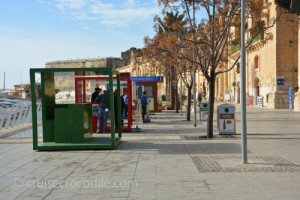 Valletta truly is one of those unique cities in the Mediterranean. It is the city that is on the UNESCO world heritage list for it’s beauty and historical significance. Valletta contains buildings from the 16th century onwards, build during the rule of the order of St. John of Jerusalem. Especially when you sail into port or walk through the city centre you can clearly see they build it with the clear intent to withstand any attack especially from the Muslim Ottomans. Valletta was designed by military engineers and it remains fundamentally the Knights city where the layout has changed little over the centuries. It is a true gem to explore especially if you have done your research and read up on its history. Valletta is a small peninsula of 1000 x 600 meter so consider exploring Malta in the morning and exploring Valletta in the afternoon. You’ll come across these booths on your way out of the port. Stop here to get whatever you want to know or need to get. This is your first stop. The port doesn’t provide wi-fi, but the cafe’s and restaurants you’ll see just across the dock will have. So make yourself comfortable with a cool drink and get online. – How far is the city centre? If you are docking at the Valletta Waterfront you’re about a mile away from the city centre, provided you take the Barrakka lift. – Can I pay with euro in Malta? Yes, the official currency of Malta is the euro. – How do I pay for the Barrakka lift? You pay 1 euro cash at the machine. 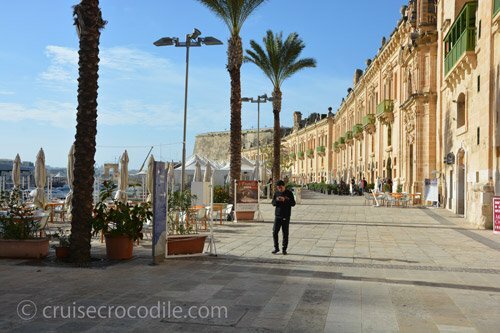 There are a couple of options where cruise ships can dock in Malta, but most of the time you will dock at the Valletta Waterfront depending on how many ships will be in port. Valletta Waterfront is one of the most advanced cruise ports in Europe so enjoy all the facilities they offer. It has a convenient spot in town as it is about a 1,5 km walk to the city centre. At the waterfront there are shops and restaurants for wi-fi and refreshments. On your way out you will cross the a tourist information point that provides you with a free map of Malta and Valletta. Next to the Tourist information stand is the taxi desk, the hop on hop off bus desk and car/scooter rental desk. By foot, taxi, public transport or hop on hop off bus. It is up to you how to spend your day and what form of transportation would suit that. Please find underneath the break down of the available options. All prices are per taxi, up to 4 persons. As an alternative to your normal taxi you can also rent a “Cab Horse Ride” which is 60 euro per hour in which they give you the full tour around Valletta. There is a hop on hop off bus in Valletta. There are actually more companies that provide one. Therefore is a bit confusing from time to time on which bus you belong. To make it more difficult each company’s provides multiple routes all over Malta. The nice thing is they are relatively cheap with an average price of 15 euro a day and it is a nice way to see more than just Valletta. Keep a close eye on your time and the route you are taking and the company that best suits you. Marsaxlokk is a famous fishing village in Malta. It is mainly known for its unique harbour where the colourfull boats lay at anchor. Malta is an archipelago and therefore you could imagine that the local rely on boats. The boats you will see in the harbour of Marsaxlokk are unique in the area. They are known for their bright colours and moustache on the front. Enjoy a nice refreshment and local dish here at on of the many cafes and restaurants around the harbour. In the 16th century the brotherhood found they needed a new church. This new building would be dedicated to their patron saint St. John the Baptist. It became more than a building of collective worship. It would finally become a place that would embody the wealth, glory and power of the Order of St. John itself. Make sure not to skip this unique piece of architecture with all of its rich golden decorations and 375 grave stones on the floor. Most cruise ships dock at Valletaa Waterfront. 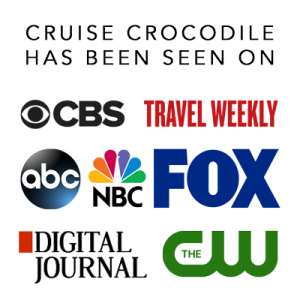 This dock offers great facilities like a bars, restaurants, shops and transportation booths. You will find all you need for a great start of the day in port at the cruise terminal. To walk to the historical city center you simply turn right when you exit the port and take the elevator up to the old town. 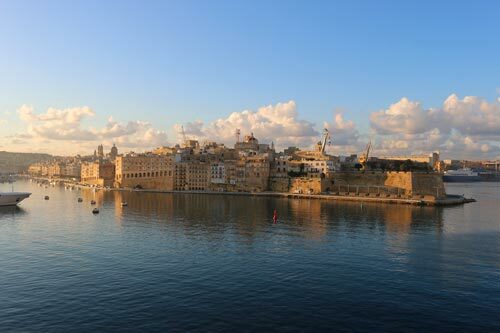 Read the full Valletta cruise port guide for all the information. This is a service also available in port. Have the freedom to ride around the island all the day long. Find the information booth at the waterfront cruise terminal. Triq Ir-Repubblika is the spine of Valletta. Its main streets runs north to south, hitting a lot of highlights along the way and it is also the most popular shopping street of Malta. In 2012 a new elevator opened up, linking the Grand Harbor to the Upper Barrakka Gardens and Valletta city center. When you exit the port, simply take a right, walk down the street until you see the elevator on your left hand side. Get a ticket for the way up for 1 euro at the machine, down is free. It will save you a 58 meter climb up the road to the higher city center. The lift is wheelchair accessible. Take the Barrakka lift on your way to the city and the first you’ll see is the Upper Barrakka Gardens. Enjoy the best views in town as you’ll look out over Senglea, Vittoriosa and the Grand Harbour. The park itself is very beautifull and full of information. Make sure not just walk through it, hand around for while. We find the Blue Grotto in the south east of the island. It is one of the most scenic coastlines in Europe. Come here to enjoy the views, a nice lunch or take a boat to explore the numerous sea caverns you can find here. Cisk (pronounced as Chisk) is brewed on the Mediterranean island of Malta since 1928. The name Cisk originated from the Maltese mispronunciation of the world “ Cheque”. It is not the most spectacular beer in the world, but when in Rome…..
Whatever you do, don’t miss the opportunity to see your ship sail into Valletta. This truly is one of the most scenic approaches in the world. The ship goes into the natural harbour of Valletta while this and the 3 cities are coming by your window. Aside from Valletta, Mdina is the most scenic spot on the island. It is the old capital of Malta. This 6000 year old town is nowadays mainly known for being the fortified silent city. It has a labyrinth of little streets and there is always something new to find around every corner.